As promised, I’m back with a tutorial on how I made the pennants for the Easter banner I designed for Spellbinders™ Bunny Hop last week. I’m also going to be posting a tutorial for the Easter baskets at the bottom of the pennants and the ribbon and bows. I’m starting first with the pennant, I’ll move on to the Easter basket and finish up with the ribbon later in the week. I thought I’d try something new and fun for you! When I get to the last of the tutorials, showing how I wove the ribbon through the pearls and attached it to the back of the pennant, I’m offering the completed project as blog candy. What do you think? Would you like to play along and have a chance to win the design in the tutorials? All you have to do for a chance at winning the design is leave a comment at the end of each tutorial telling me what you think of the tutorial. At the end of the week I’ll select a winner using Random.org. 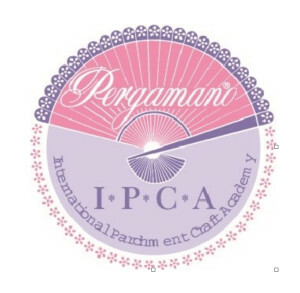 Again, to be eligible to win the design, you have to leave a comment on each tutorial. For all you seasoned crafters, hang in there and speed read . . . LOL . . . I don’t want to leave any newbies behind! I’ve received a lot of comments and e-mails asking where I purchased the paper for the pennants. I photocopied the pictures from my sons’ Beatrix Potter Giant Story Book onto white cardstock that I purchased from Staples. The book can be purchased on line for those of you interested. Due to copyright laws, I cannot copy the pages for distribution, nor can I sell any of my designs, they are for my personal use only. I apologize for the quality of the photos, I don’t have an area set up with proper lighting for tutorials yet. 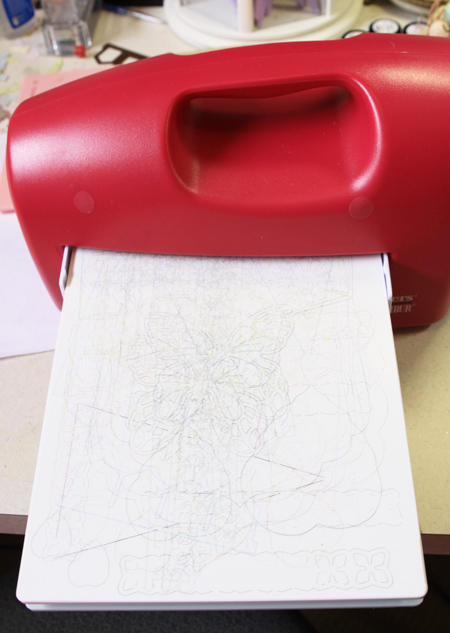 Turn the paper over and place it on the Base Plate that comes with the Grand Calibur (or whichever system you’re using) and cover with the cutting plate. Feed the sandwich through the Grand Calibur as shown. Your cut image will look like this from the back. 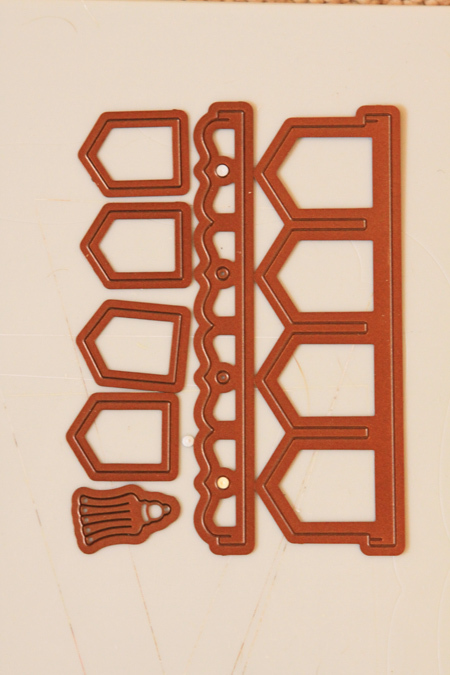 Leave it on the Base Plate and cover with the tan embossing pad and Embossing Plate. Feed this sandwich through the Grand Calibur as shown. 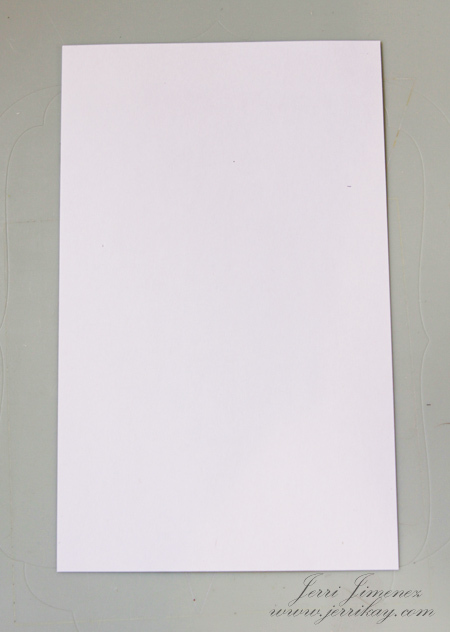 Using cardstock color of your choice, cut the largest lacey pennant to go behind your image, follow the same procedure to cut and emboss as above. Turn the image over and apply adhesive to the back side as shown. Carefully adhere the image to the lacey pennant as shown. Zip Dry dries very quickly, however, it does give you time to slide the paper around for a perfect fit. 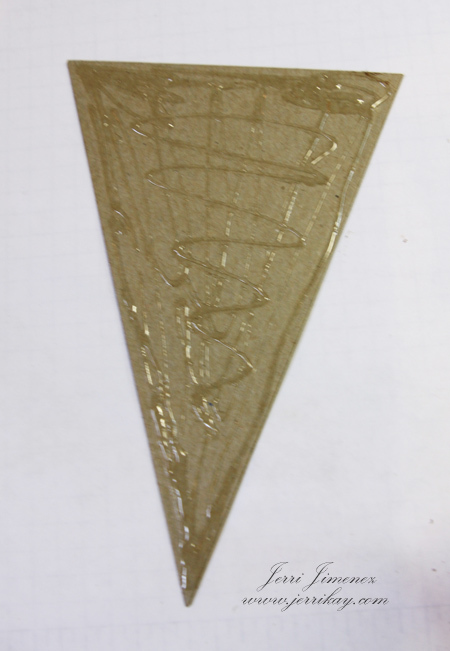 Apply small dots of Perga Glue adhesive on the lacey pennant as shown. Using a large needle, pick up a pearl and place it on a dot of glue (I used Darice pearls that I purchased at JoAnn Fabrics, they come in a bag of multiple sizes and are located in the bead section. ), gently pull the needle from the pearl. 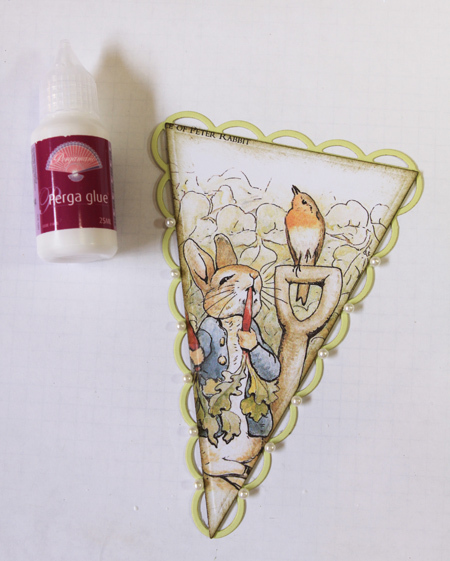 I prefer to use Perga Glue for this, it has a much stronger hold than Zip Dry and has a small nozzle perfect for application of the small dots of adhesive. Do the same on the opposite side, for a total of 12 pearls (six on each side). Do not place pearls on the top scroll or across the top of the lacey pennant. 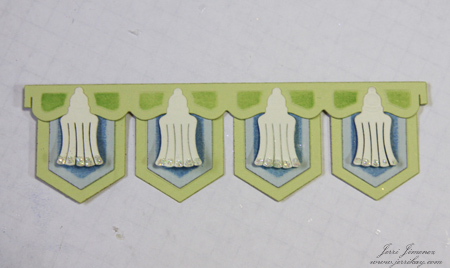 Place these dies from the Banner Basics Three set on the Base Plate. (You will need to cut four of the small tassel. If you want your tassel to be the same color, place it on the plate now. I selected a cream color for the tassels on my banner and cut them later.) If you’re covering the back side of your lacey pennant, you’ll need to do this step twice (see below). Cover with cardstock and feed through the Grand Calibur. 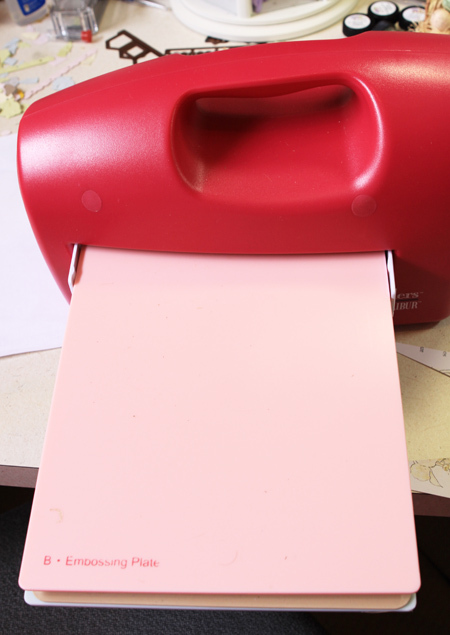 If you’re using two colors on the banners as I did, you’ll need to follow the last two steps to cut and emboss the pieces in your second color. 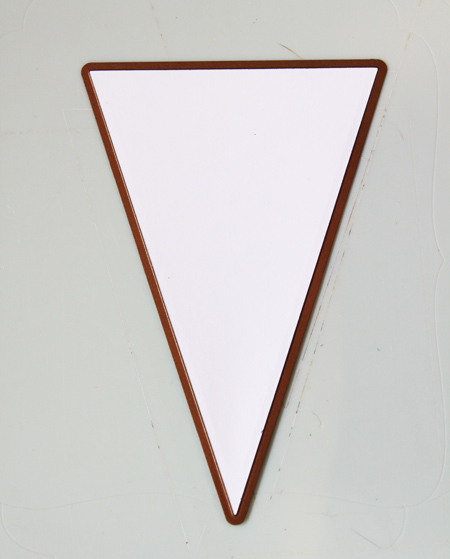 I’m only making one pennant for the purposes of this tutorial. However, in the original Easter banner I made, I followed this step with all four colors and interchanged the pieces, i.e., pink/yellow and blue/green. 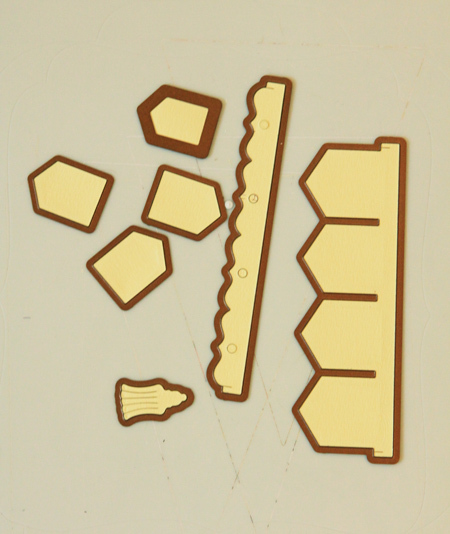 Using inks of your choice, sponge color on the smaller banner pieces and the longer narrow strip, using your dies as stencils (as shown). Here you see that I have the four small tassels in cream cardstock. 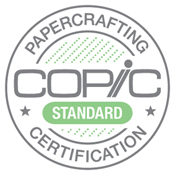 You can cut two layers of cardstock at a time. I fed the tassel die through the Grand Calibur twice for the four cuts. Adhere the four blue pieces onto the green banner with adhesive, then adhere the narrow green stenciled piece, placing the tassels on top (tassels are normally placed at the bottom of the banner, however, for this piece I chose to place them at the top). Small dots of adhesive were placed on the tassels and glitter was applied. 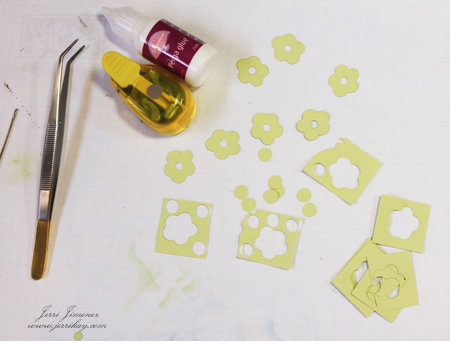 Cut 8 flowers using the flower die from the Easter Fun dies. The centers are cut from the flowers. 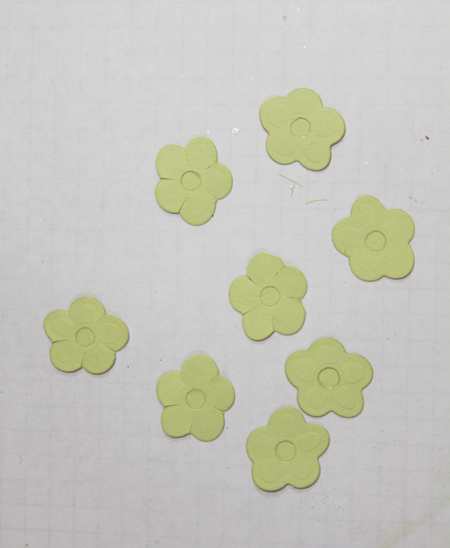 I used a small circle punch and punched circles from the scraps of paper and adhered them to the backs of the flowers. Perga Glue is a better choice here than Zip Dry adhesive, we want a firm bond that will not separate. 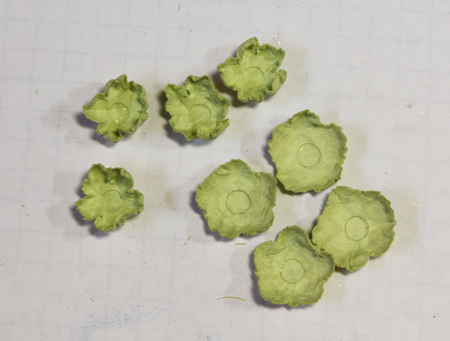 Once the adhesive is dry, cut slits in four of the flowers, every petal as shown. I used an embossing pad, a large ball embossing tool (for the lower petals) and both the small ball and the large ball embossing tools (for the upper petals) to shape the flowers. The flowers that you cut slits in are the upper petals. Place adhesive inside the larger flowers and place the smaller flowers inside. Place adhesive inside the smaller flowers and place the pearls inside the flowers. Let adhesive dry and then add glitter to the edges of the petals. Let adhesive dry. Adhere the banner to the pennant centering it on the image. 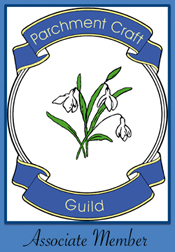 The top of the banner should be even with the top of the pennant so that the lacey scroll is visible at the top as shown. I’ll be back soon with the Easter Basket tutorial. I’ll attach the baskets to the bottom of the pennant in that tutorial. Thanks so much for stopping in and don’t forget to leave a comment if you’d like a chance to win the finished pennant design in this tutorial! How kind of you to put up a tutorial on your wonderful project, thank you!!! I just love your blog page, the beautiful projects you make and inspiring us. I loved seeing how you made the banner and pennant. I like how you used the cardboard box behind the paper. And just all the little details you add to it really makes it so special. Very fun to view the process! Lovely project! Beautiful banner! I love seeing all the details you put into your work. Makes it extra special! Thank you so much for the excellent tutorial. Very easy to follow. The detail in your work is fabulous. Lovely work!!! WAUW thank you so much for this awesome tutorial here,It´s really easy to follow. It´s so gorgeous. We all just loves it. Thanks again for the chance and have a wonderful day. Thanks a million Jerri! The tutorial is fabulous and the blog candy is the sweetest ever! Yummy indeed! Thanks so much for sharing your special project with all of us who love your work so much, and how generous to offer this beautiful time consuming project as blog candy. Everyone who has a child or grandchild knows the story of Peter Rabbit. 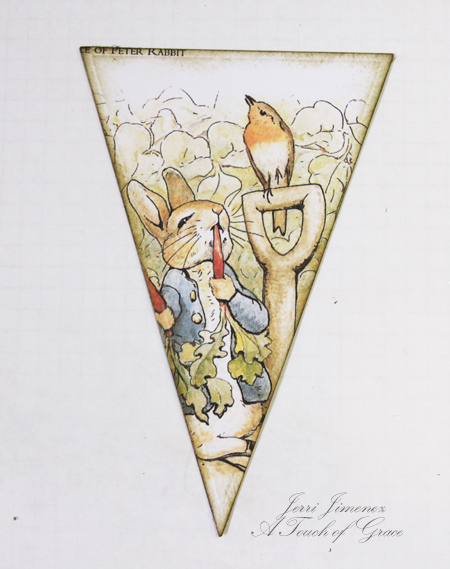 The illustrations of Beatrix Potter’s book make this banner extra special. Wow, it would be wonderful to win this! GREAT tutorial, THANK YOU!!! I am new to cardmaking and a detailed tutorial really helps. I love your creativity, thanks for sharing with us! Jerri, thank you so much for your pennant tutorial! This is such a work of art-I never would have thought the paper you used was NOT scrapbook paper!! You definitely think outside the box; that accounts for your creativity. I can’t wait to read the next installment of the tutorial. Thanks for the chance to win this blog candy!! LOVE it! Wonderful! I so enjoy your tutorials and all your beautiful designs. Jerri, I don’t know how you come up with your ideas, but sure glad you do. You do amazing work. I love your site. Thank you so much for sharing with all of us. This was a gorgeous pennant, I’m so glad you shared with us how you made it. I love all your pieces Jerri! 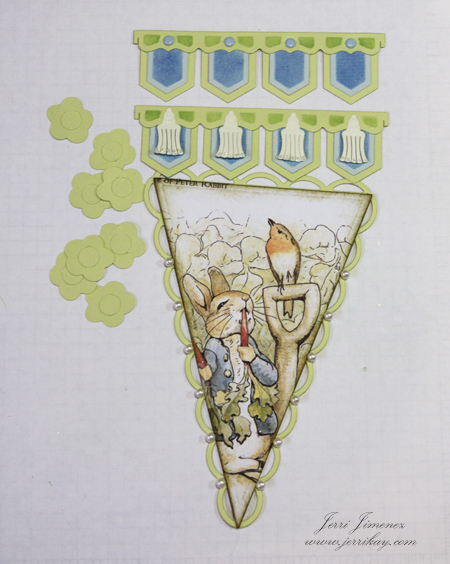 A wonderful tutorial for a wonderful art project. I so appreciate the details of the brand name glues used and when and why…very important info, especially from someone who creates such beautiful things all the time. ‘she knows of what she speaks’ Thanks for your unselfish giving, including this chance to win your beautiful pennant. Jerri, your banner is amazing and I am very thankful you are providing the tutorials. I love the way you used images from a children’s book. I will be on the lookout when I go to thrift stores and yard sales for some great children’s books. I also think it is great that you used Darice pearls instead of the expensive ones being that you have so many on your project. Thank you for providing such a detailed tutorial. Can’t wait for the next one. Jerri, at least I am not No. 502 on your comment section 🙂 I love this tutorial and all your attention to details which is what makes your projects look like works of art worthy of being shown in the “card museum and projects” Hall of Fame…that is if they had one, gf, you would be on top! Your pennant is just gorgeous. Thank you for the tutorial – nice to see how the experts work! You come up with such beautiful ideas. And, thanks for the chance to win your project. I think you did a fabulous job on the tutorial and as I said earlier, I really love this project. i am in awe of how much creativity and time, dedication it took to make this gorgeous banner. thank yu for the tutorial, it really shows every step, and to think you made the back look as good as the front. oh i forgot to say i’d love the chance to win a piece of your artwork. it would serve as daily inspiration and push me to up my game. Thank you so much for your FABULOUS tutorial……your tutorials are always so informative and so easy to follow. Also many thanks Jerri for offering your wonderful creation as blog candy…how wonderful it would be to see one of your wonderful pieces in the flesh!..so to speak. Fabulous as always. Love yor tutorials. Thank you very much. I didn’t think I would get the pendants from Spellbinders but you have given me second thoughts on that, Keep up the great work. As I’ve said before, God has certainly given you a special gift. I was considering purchasing the Spellbinders pennants, but now they’re a must-have! Your work is is just sublime! Thanks so much for the tutorial! This banner is just phenomenal – as is ALL your work! I just LOVE your website!! Thanks for such a great idea! Beatrix Potter is a favorite of mine but I never thought about using copies of pages from a book. You are so inspirational! Thanks for sharing that great tutorial with us. That is a great die. Your tutorials are the best. This one is yet another example of your creative designs. Just love your blog. The pastels you used in these fun pennant dies are so charming. I can just see them as a baby shower gift for the new baby’s room. They are beautifully put together as well as adorable finished. Another wonderful idea; great tutorial. Thanks so much for all your inspiration. You are one talented lady! This is an awesome project and so much detail work. 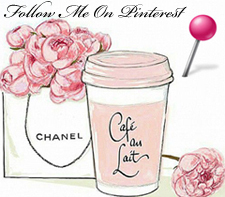 I would love to win any of your blog candies! thank you so much for a detailed and easy to follow tutorial. I’ve just bought the pennant dies so I’m off to have a go! OMGosh Jerri … if your tutorial was any easier to follow, we’d have to be attending a personal class with you in Florida! Your project was very labor intensive but so worth it … the results are unbelievable. Our daughter is having a baby girl in early June and this would be a perfect gift for her. 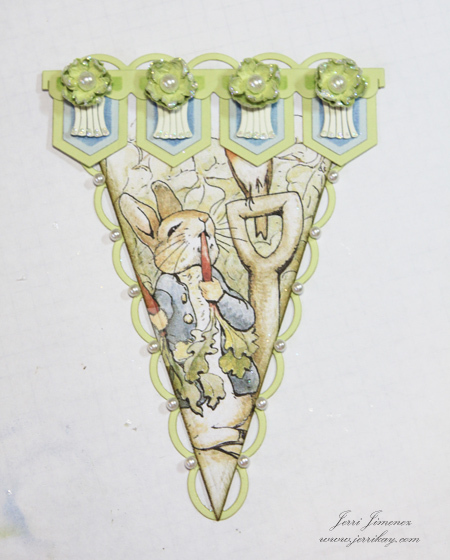 She collected rabbits as a child and has a vintage Peter Rabbit that would be perfect to go with the banner. Oh I so hope I win – if not my lucky day, I’ll try to make a banner for her using your tutorial. Thanks so much for all your awesome inspiration! So beautiful. I really need those nesties. Wonderful tutorial and your pictures really help! Congratulations on making such a great tutorial! Beautiful tutorial and some wonderful techniques that I needed to hear about. Thanks for sharing Jerri, such a brilliant design and so many ways the dies could be used. This banner is SO adorable! It has inspired me to use more creativity with the Spellbinder shapes. I’ll be looking for the next tutorial on the little baskets – thank you! Thank you for doing this tutorial! I know that must have taken a lot of time to put together and I appreciate it so much! I think your idea for the blog candy is a wonderful idea! I would LOVE to win one of your pieces and would treasure it! Everyting you do is truly a work of art and beauty. You can always tell that there is so much love put into everyting you create! Thank you for all I have learned from you over the years! How sweet of you to give away your creation! I love your tutorials, even if I’ve been scrapping for years! I still learn things. Like about Perga glue being a very strong adhesive. I hope I win, I’d love to have one of your creations. I’m so happy to see that you posted a tutorial for this project, it’s so beautiful. Being on such a tight budget, it’s nice to have someone so talented, recommend a product and save me from buying products that don’t work very well. Thank you!!! 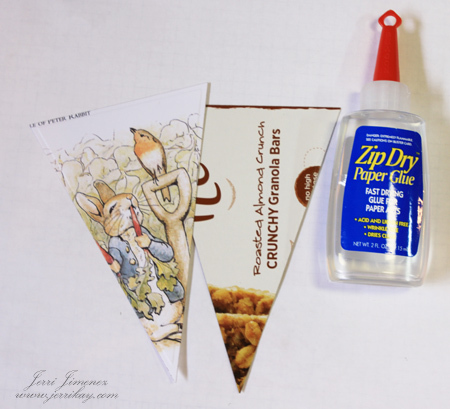 Fabulous tutorial on your adorable banner! 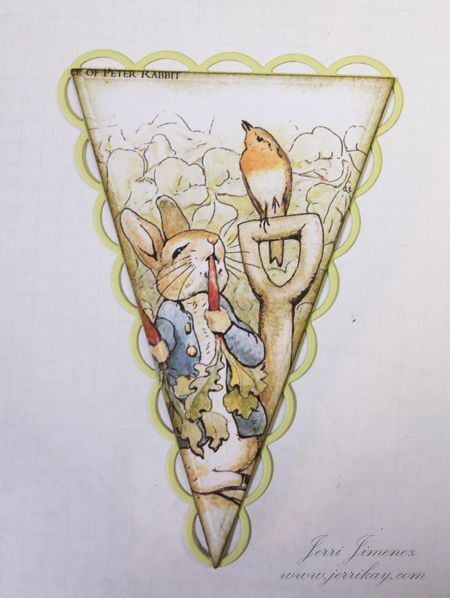 I have always loved Beatrix Potter…what a precious project! I have a couple questions Jerri. First, were you able to run that cereal box cardboard through the machine or did you have to cut it with an exacto knife? Second, is there a spray on sealer that one could put on the finished product t0 keep it fresh for years – like a shellac or somethng? There is so much to learn. Once again thank you for being a Blessing. The penant is sooooooooo cute. I love the pearls that you accented it with. What a nice card front this will make. Thanx for the tutorial and sharing of your amazing talent. 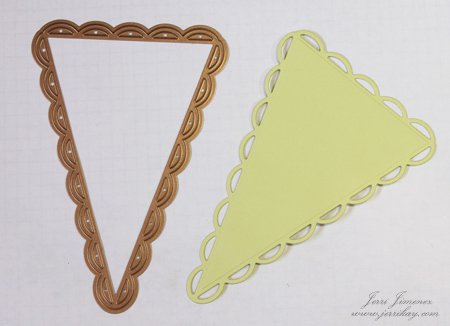 Whether a beginner or seasoned paper crafter, this tutorial is beneficial. It’s easy to follow and understand. Jerri, when you have time, please address different types of adhesives. I have never used Zip Dry. I know that different weather areas can determine the outcome of how some adhesives work. If I’m going to use glue, I want those added seconds to be able to move the piece around if I need to. Lovely tutorial. I can’t wait to find these dies. 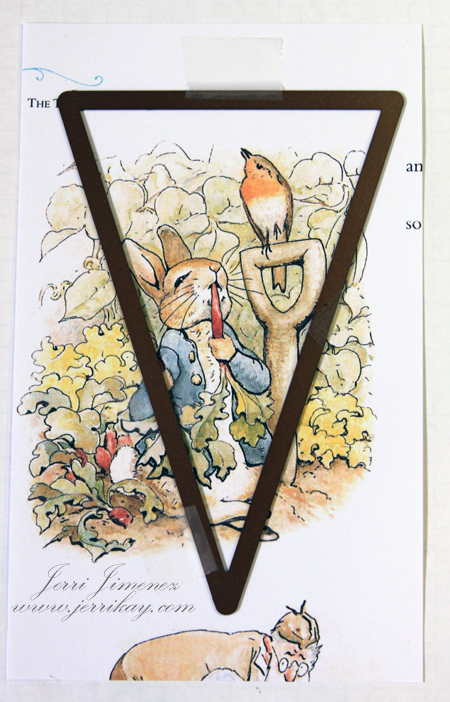 I love making banners and I adore Beatrix Potter. This is a very detailed tutorial–great job. I like your idea of using a needle to manipulate beads–I’ve used a pointy tweezers and mostly the beads just get launched into space. What kind of printer are you using to copy the book pages? It looks like great quality for copies. It is so nice to see this step-by-step and so close up. I am still so amazed at the banner you made the other day–it was so spectacular! I love reading tutorials and the only comment I could suggest (to anyone, not you specifically) is to put it in a PDF file that we could click and download it to our PC–and/or print as a document to file. That would be awesome. I’ve never seen anyone do that before but it would be super great! Thank you, thank you, thank you for doing a tutorial on your awe-inspiring Beatrice Potter Easter Banner!!! Everything was explained in detail so now I can try my hand at making one. I am so looking forward to your future tutorials! And……hoping my number gets picked by Random.org so I can hang your precious banner on my mantel for everyone to see this Easter! Love your work, bunnies, and spellbinders. The tutorial is great to point out all the little details that you might miss in just looking at the overall picture. But without those little details it just doesn’t have the same punch! Jeri, your work has always left me speechless. It is so amazingly beautiful. What a great idea about the Beatrice Potter book. I would love to win the banner for my grand-sons room. Thank you for the great tutorial. Wow! I love it. Great tutorial, easy to understand every step and the result is wonderful. Thanks sooo much. Hi Jerri, A very detailed tutorial and gosh, how can you think of so many little details to be captured in your work? You are simply amazing & detailed oriented!! Thanks for sharing your great project!! Looking forward to your Easter basket tutorial soon!! You do a great job with your tutorials! Of course, it helps that you are showing us something we WANT to do! Your projects are always so beautiful. 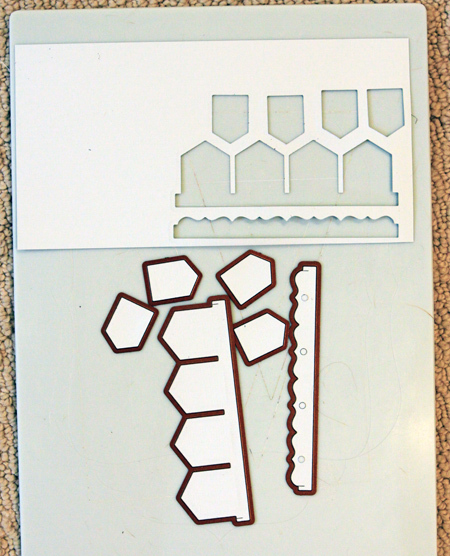 I have just purchased your tools for embossing so I can make the flowers from your other tutorials. Can hardly wait to try my hand. I love how you spell every detail out in your tut…so easy once you say all the details…I must get some of that removable tape. Love your blog. So creative, Jerri.. wonderful tutorial. I LOVE all of these banners. I love your tutorials…they are so well written and concise I can understand each step!! Also, thank you for mentioning your adhesives and supplies…that is so helpful. 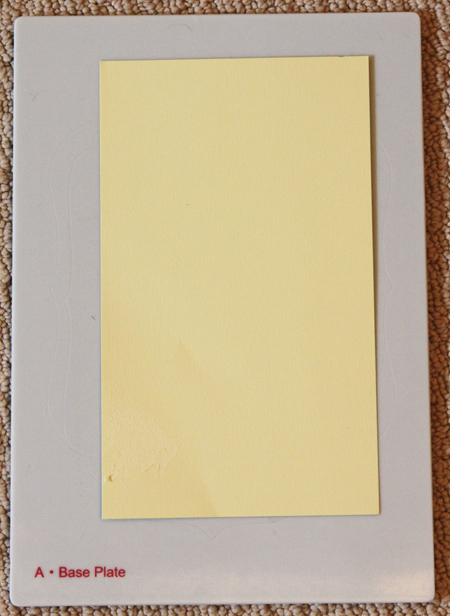 I have found that adhesives can make or break a project. I plan to try the Zip Dry. Your Peter Rabbit banner is fabulously wonderful. Beautiful, love your idea of using the cereal box to give it more stability, and the flowers are so pretty you would have never known they were made from that die. I am in the midst of making a card box for my daughters wedding and I am applying lace to the box that I have painted, I tried spray glue but now it is all coming off, I am thinking about trying fabric tac next, do you have any thoughts of what I should use? Thanks so much also for the chance to win your extraordinary piece of art. I love it! WOW! Just when I think I am not interested in something then I see something like this and WOW! I have a young couple that want to have a baby and they asked me to do the baby shower cards I would love to make this for the showers banner. WOW! Beatrix Potter’s illustrations are just so “easter” aren’t they? What a lovely idea. I loved the tutorial. You are very good at instructions in addition to being totally talented! Can’t wait to see the little basket! What an ADORABLE banner – it’s just priceless! 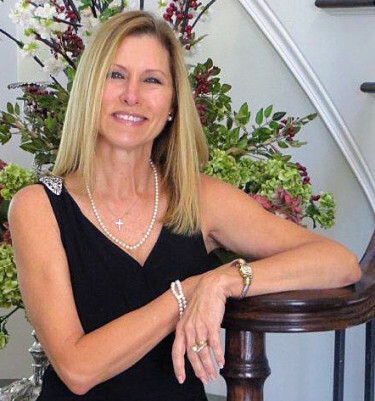 I love the finishing touches you put on it – flowers and pearls. What a perfect idea for a baby shower gift! This project is just stunning, awesome details. Great tutorial. Thank you so much for the detailed tutorial. I love your banner Peter Rabbit is my very favorite. Thank you so much for sharing your amazing talent. Great tutorial you are so kind to share your amazing talent with all of us. Your banner is so beautiful as is all of your creations. I love your step by step tutorials. 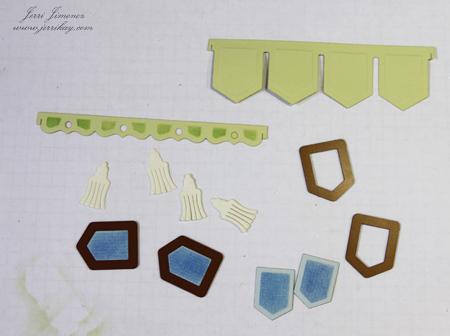 The pennants are such a great die set and your tutorial really brings them to life. Just in time for Easter you have once again offered up something amazing. Thanks for sharing! Have a great weekend! Another Great Inspirational tutorial. I love the use of Beatrix Potter. As always, I am blown away by your work. I appreciate the detailed instructions you give. I know it must take a lot of your time to do this and I’m sure I can say for everyone “thank you”. I am so in love with your projects, Jerri! You have such a creative talent that is to be envied! This pennant banner sooooo adorable! Another beautiful work of art. Thank you for being so generous and showing us how to make this. Jerri, I didn’t purchase the pennant die because I couldn’t think of a good use for it — well now that I have seen your great creation it is on my shopping list. So pretty. Great tutorial. You are so creative, thanks for sharing. I love this banner, it is beautiful. so clever to think of copying the images from your son’s book. Thanks for the tutorial. Excellent Tutorial! And what a great idea to copy children’s books! I have a small collection that would be perfect for a project like this! Thanks for sharing your talent! Love the work, love the caring. Thanks for being so inspiring. As always wishing i was as talented. God Bless…. As usual your tutorial is precise and concise and very easy to follow. I love having the photos showing step by step which is so helpful especially for those of us who need to see before understanding. Beautiful work as usual. Thanks, Jerri. I love these pennants! 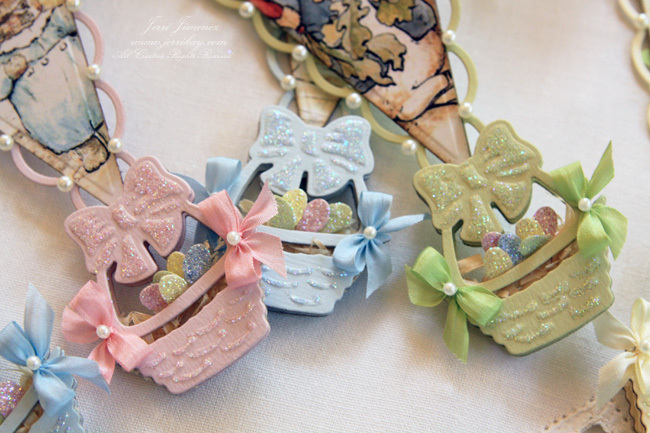 The soft sweet colors are just heart warming, with all the ribbons and our favorite childhood Beatrice Potter stories. Beautifully made and beautifully photographed. You are tops, Jerri. These pennants are great. They make me smile and bring back fond memories. That is what art is all about – emotions. Thank you Jerri! You have done it once again. I just marvel at your talent. 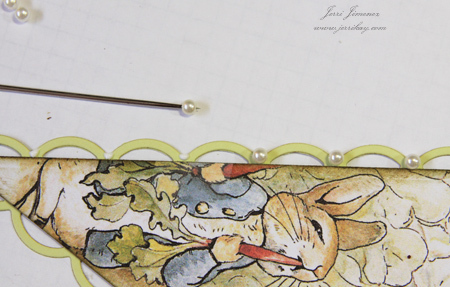 I have fallen in love with this Peter Rabbit banner. Thanks for doing this tutorial. I love your choice of Beatrix Potter, perfect for Easter! I really love how you did the banner. I didnt think I wanted to get this die but you have totally changed my mind. After seeing your Easter banner tutorials, I ordered the the Spellbinders Penants and Banner dies so I can make some of these to give to my family and friends. I know I’m going to wear a path in my frontyard running to the mailbox everyday until they ariive so I can get started……..LOL!!! Jerri, Thank you for all of the inspiration you have given to all of us through your tutorials! WOnderful tutorial! I’m a seasoned crafted and even I got quite a bit out of it! I love the thought of copying pages from a book, may have to go and raid the kids bookcases. A great tutorial – thank you. You can’t imagine how bad I want this. I’m working on the perfect project for it right now! Thanks for the opportunity. I love it.